The tastiest way to get your veggies in. Where do you find the richest, juiciest, meatiest burgers in New York City? Those in the know seek out Pat LaFrieda & Son, where they’ve been cutting and grinding top-quality meats for more than 90 years. We wanted burger tips from the best in the business, so we tracked down Pat LaFrieda himself to learn about his approach…. Four out of five Americans will be enjoying meals hot off an outdoor grill this summer. This can be good news and bad news for the health-conscious eater. What’s the Best Way to Top a Burger? Ask 7 different food fanatics what the best way to make a burger is… and you might come up with 14 different answers. At least that’s what happened to us! Read on for their tantalizing ideas. 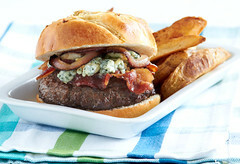 Then tell us about YOUR ideal burger at the FreshDirect Facebook Wall…. It’s Burger Week at The FreshDirect Feed, and we’ll be celebrating America’s favorite sandwich all week long. To kick off the party, we’ve selected five tantalizing recipe options from our One-Click Recipes section. Though the word “burger” typically conjures a vision of beef patties sizzling on a grill or in a skillet, there are nearly endless possibilities for what goes between the buns. From tuna burgers and lamb patties to burgers topped with blue cheese and pineapple relish, these five recipe selections show off a few inventive twists on the classic cookout favorite….